In the final months of my second pregnancy, my legs were swollen to a rather extreme degree. My friends—and sometimes strangers—often noticed and offered advice based on personal experience. I was frequently advised to elevate my legs, drink more water, and avoid salt. Some of the more offbeat advice included eating lots of asparagus. When looking up planting details for this early spring perennial recently, I came across some interesting facts, one of which reminded me of this unusual recommendation. Apparently, asparagus is high in asparagine, an amino acid, which acts as a diuretic. It’s also a good source of folate, which is widely recommended before and during pregnancy. Since I’m not qualified to offer medical advice, I thought I’d pass along some of the other asparagus facts I came across in my reading. Some of the details are instructive, from either a historical or backyard gardening perspective; the others are simply fun dinnertime trivia. Asparagus was first grown in Greece nearly 2,500 years ago. Ancient Greeks and Romans believed asparagus helped prevent bee stings and relieve toothaches. In the 1st century B.C., Romans became the first to preserve asparagus by freezing it in the Alps. The top asparagus-producing states are California, Washington and Michigan. China, however, ranks first in world asparagus production, while Peru is second and the United States is third. Asparagus is a member of the lily family, which also includes onions, leeks and garlic. Under ideal conditions, an asparagus spear can grow 10 inches in 24 hours. After harvesting, the spears grow into ferns, which produce red berries as well as the nutrients necessary for a healthy crop the following season. If started from seed, asparagus will take about 3 years to become fully productive. A well-cared-for asparagus patch will typically produce for 15 or more years. Asparagus contains nofat or cholesterol and just 3 calories per medium-size spear. Peak asparagus season is April through June. To best maintain freshness, refrigerate the stalks in a cup of shallow water with the tip ends pointing up. 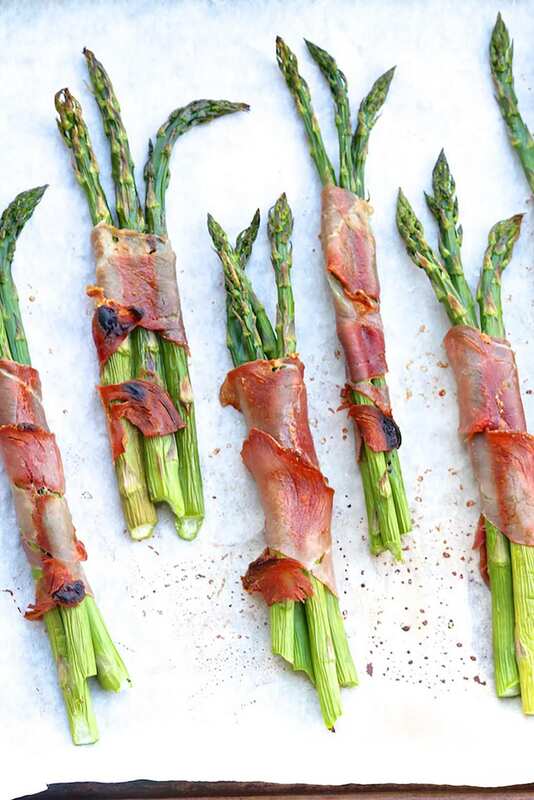 For added ease, you can wrap the asparagus in the prosciutto several hours in advance. Simply cover and refrigerate until ready to bake. 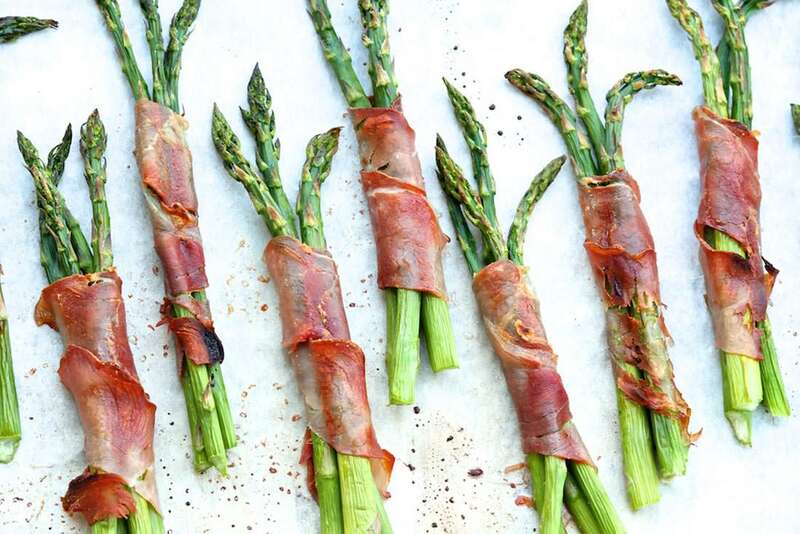 Wrap the asparagus with a piece of prosciutto that has been cut long-ways, starting at the bottom of the spear and working your way up. Wrap as tightly as you can. Place the wrapped spears on a lightly greased baking sheet*, tucking under the prosciutto ends. Roast for 5-8 minutes, depending on thickness (which tends to vary greatly with asparagus). The spears should be slightly more al dente than you’d prefer to eat them at this point; check early by inserting the sharp point of a knife into one of the spears. Switch the oven setting to broil, and broil 1-2 minutes, rotating once, or until the prosciutto is crisp. Watch carefully so as not to burn. *Lightly greased foil may be used for easy cleanup. If you prefer to line the baking sheet with parchment paper, watch it very carefully when broiling as parchment can burn. 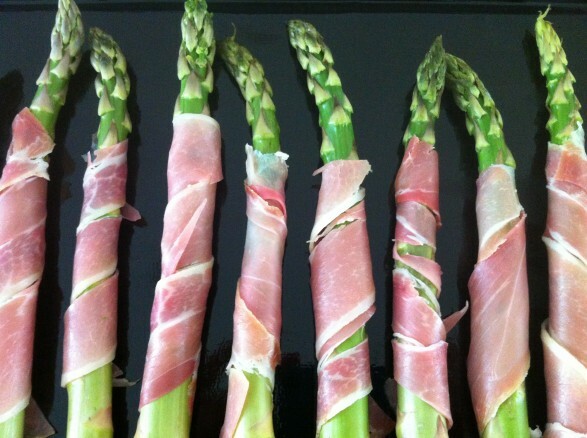 Ask for the prosciutto to be sliced paper-thin; this will help it to crisp up before the asparagus is fully cooked. It may tear more easily when the spears are wrapped, but that’s okay. Just tuck in the ends and keep going. Thicker slices of prosciutto will still taste great; it’s just that the asparagus will likely be fully cooked before the meat becomes crisp. The asparagus may be wrapped in advance and refrigerated. It’s okay to refrigerate the wrapped spears uncovered. This will actually help dry out the prosciutto, which aids in crisping later. Beyond a few hours, either cover everything with plastic wrap or cover just the asparagus ends with a damp paper towel. As an option, you may cook the asparagus on the grill over medium heat until the asparagus is tender. Carefully rotate the well-wrapped bundles a few times to evenly crisp the prosciutto, and adjust the temperature down if the meat is cooking more quickly than the asparagus. When cooking on the grill, you might also find it helpful to secure the prosciutto with a wooden toothpick that has been soaked in water to prevent burning. Once the asparagus spears are wrapped, you may cover and refrigerate until ready to eat. If the spears are very thin, you can bundle a few and wrap as directed. I took this old photo (above) with my phone, and it shows how the thin strips of prosciutto become crispy at the edges and totally delicious. Wrapping the spears in paper-thin slivers of prosciutto, then roasting at a high heat, adds a salty, savory, crispy layer that’s truly a treat. Asparagus also happens to be a good source of fiber, folate and potassium. So glad you liked, Linda! Thanks for the comment! I have heard of this but have yet to try. Thank you for the great reminder!! Just got some asparagus in my Green Bean delivery Ann.. And they are thick spears so this recipe will be perfect! I bet your fresh asparagus will taste wonderful! Wish I were there to share! I bought proscuitto over weekend, so I am making this tonight! Question though Ann, I am also going to roast some portobello mushrooms and they are to go in at 425 oven…should I split the difference temperature wise? Any thoughts or advice? I think that would be fine, Mary Lou. The mushrooms would probably be fine at the higher temperature and the asparagus would most likely be quite similar at 425. Splitting the difference sounds like a great idea. I bet they will both taste terrific! Delish! Both mushrooms and especially asparagus were terrific. HOW WONDERFUL A LOVELY WAY TO SERVE ASPARAGUS. 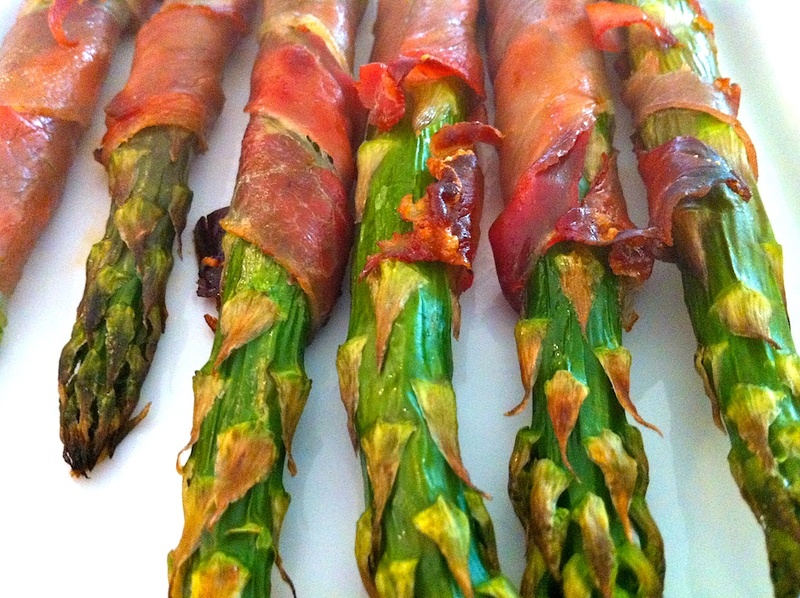 Thank you for an easy seeming idea; I’ve never tried prosciutto, but I do like asparagus a lot, and all the little tidbits you gave were helpful as well as interesting. My pleasure, Vicky. I’m glad you enjoyed the fun trivia and hope you get the chance to try! This is one of my family’s favorite snacks. I love making it with Neufchatel cheese on top of the prosciutto, have you tried it with cheese before? So good! I haven’t tried these with cheese, but I bet it’s delicious!